The MC3010 is suitable for vehicles with wheels between 65" and 105" in size, this wheel chock offers lightweight yet incredibly resilient construction; the entirety of the MC series offers a larger base surface area than the AC and UC models from Checkers® giving superior surface grip. As per the rest of the Monster® range the MC3010 is made from UV stabilized Polyurethane that offers a long life span along with weather and chemical resistance. The MC3010 incorporates both a recessed carry handle and holes that allow for fitment of chains, mounting brackets or ropes. Moulded-in ANSI Z535.4 compliant proper chocking guidelines offer a reminder to users on correct chocking procedures. The MC series of wheel chocks have been engineered for use with heavy equipment such as haul trucks, and cranes, for this reason they are frequently seen in use on mining sites around the country. If you need stainless steel cleats for secure anchoring of the chock on snow and ice then these can also be found in the related products section below. Not sure which size of wheel chock that you need? 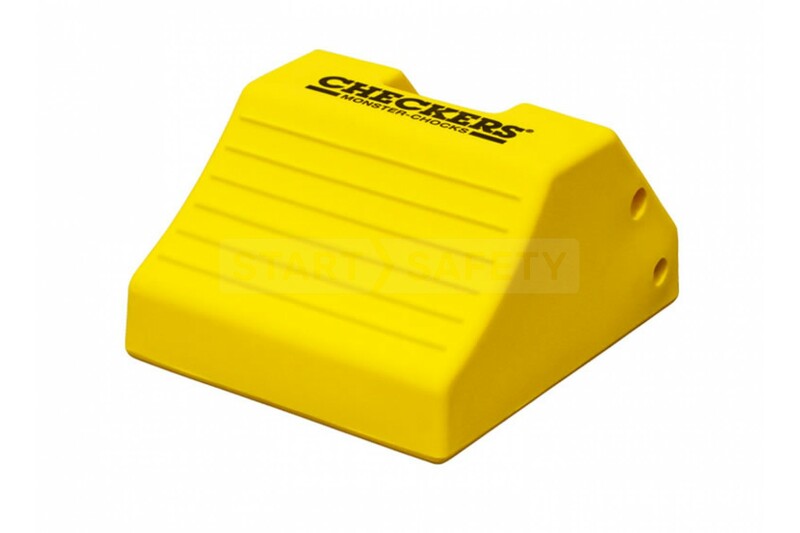 Check out our complete guide table here: Checkers® Wheel Chock Guide.